Citizens protesting against the JGSDF deployment plan and resolution by the city assembly while holding red placards. Regarding the debate over deployment of the Japan Ground Self-Defense Force (JGSDF) to Ishigaki City, a rally march and citizens’ gathering were held on September 29 in protest of the city assembly’s passing of a resolution to request the deployment. Approximately 200 citizens attended the event, which labeled the decision by the city assembly an autocratic action. The group also passed a protest resolution at the meeting. The participants departed from the Okawa community center and continued the protest walk through the city, passing the city office, for three kilometers. The protestors chanted together, saying they won’t let the city assembly dictate, and that the mayor and the assembly must respect the voice of its citizens. 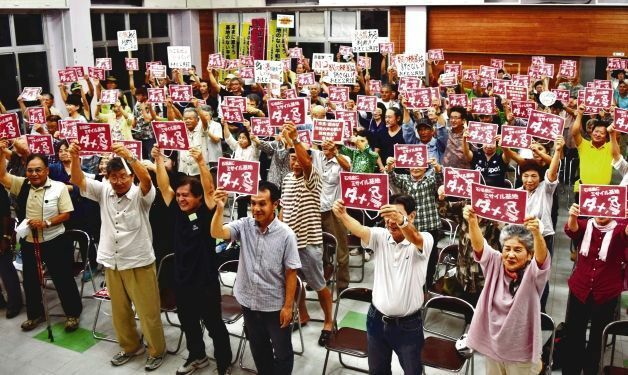 The group later held a meeting at the Okinawa community center, where residents living near the planned deployment location in Hirae Omata shared their concerns. The residents appealed to their leaders, saying (about the resolution) they were deeply upset by the resolution, and that it was forcibly carried out without clarifying the detail about the deployment sites and the number of troops. They said local residents must stop the deployment plan because it would degrade their peaceful life.